Today marks both the beginning and end of an era for Four Roses. It’s Brent Elliott’s first day on the job as master distiller. He also follows Jim Rutledge, a legend in the industry who marked his retirement yesterday, August 31, 2015. Elliott served as both Quality Director and Co-Master Distiller, and has been with the company for ten years. He is the face of a new chapter for Four Roses and is no stranger to making good whiskey (read my recent interview with Elliott here). Jim Rutledge has been in the business for 49 years. To put that in perspective, the Rolling Stones had only been around for a couple of years when Rutledge started his career. There aren’t a lot of folks who can say they’ve been in the bourbon industry for that long. He’s the reason Four Roses receives the acclaim it rightly deserves. I could write a thousand words praising Rutledge and his work, but let’s focus and get to the whiskey. Jim Rutledge is leaving the industry “on a high note,” as he put it on a recent press release. This year’s limited edition Four Roses Small Batch is his swan song. It’s being presented as a tribute to Rutledge. The barrel strength bourbon (108.5 proof) features a blend of different bourbon recipes: 16-year-old OBSK, 15-year-old OESK, 14-year-old OESK and an 11-year-old OBSV. 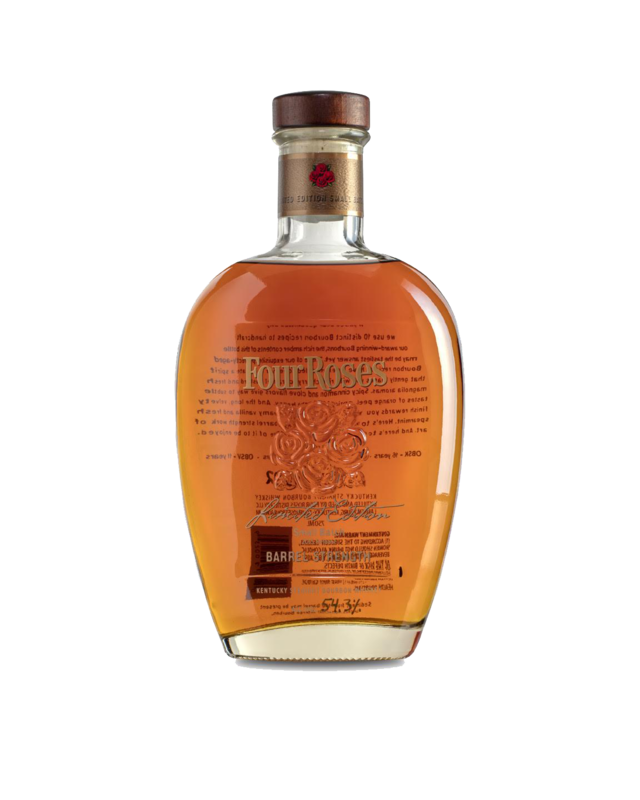 You can read more about all 10 Four Roses bourbon recipes here. Last year’s Limited Edition Small Batch was much younger, featuring a blend of bourbons aged between 9 and 13 years. The nose starts off with a some alcohol vapor. Then I can describe the nose as prominently fruity, herbal and slightly floral. I get berries, honey, dill, vanilla, and caramel. In terms of floral, I can’t name a specific flower, but more or less the essence of the floral aisle at a garden shop. Official tasting notes mention “fresh magnolia”. Let’s go with that. Taste-wise, a wallop of cinnamon spice starts things off, followed by a slight dill note (could be the high rye), a touch of oak, creamy vanilla, caramel and candied orange peel. The finish is long, with oak, vanilla and a hit of mint on the backend. What we have here is a beautifully crafted, complex bourbon, full of traditional bourbon flavors as well as less common ones. There’s lots going on here, and it mingles together wonderfully. My one slight nitpick is the initial whiff of alcohol. It’s a little strong right up front, but that’s somewhat expected for a barrel strength bourbon. Letting my glass sit for a couple of minutes made this pretty much a non-issue. The finish really has a big prominent mint note, which was the perfect end to a great expression from Jim Rutledge and Four Roses. Four Roses Master Distiller Brent Elliott said “I couldn’t think of a better way to toast Jim’s exceptional career.” I completely agree. This release will hit shelves mid-September and kicks off the annual wave of autumn limited bourbon releases. Highly recommended.